There are certainly reasons to be somewhat sceptical about BRI's future success. There are gaps between the sums promised and delivery on the ground. New investment commitments might be declining. Chinese companies have often struggled in new operating environments. Much of the financing has gone to pet projects or constituencies of local leaders. Chinese initiatives have sometimes resulted in popular protests (and occasionally violent opposition) in Myanmar, Thailand, Sri Lanka, Pakistan, Bangladesh, and East Africa. And Beijing's propensity to sweep many existing initiatives under the BRI umbrella or shower state support on nominally-linked projects tends to inflate its importance. Despite the bold public face, some Chinese analysts and businesspeople acknowledge these deficiencies in private. India's concerns with BRI are specific. One set of issues relates to the China-Pakistan Economic Corridor (CPEC). Not only does this transit territory claimed by India, thus dropping any pretence of Chinese neutrality between India and Pakistan (and, from India's perspective, violating Indian sovereignty) – it threatens to connect what have so far been two different theatres for India. Furthermore, New Delhi is concerned that Pakistan's overdependence on China could turn it into a client state. While some in Washington may be reassured by China assuming greater responsibility for Pakistan's stability, New Delhi believes that with few exceptions, China has not played a stabilising role in South Asia. The second set of Indian concerns relate to the Maritime Silk Road, where India perceives many commercial projects being potentially used for military purposes. Djibouti now hosts China's first overseas military facility, the port of Gwadar is evolving into a Chinese outpost, and the People's Liberation Army Navy (PLAN) already utilises Karachi and the Seychelles for replenishment and refuelling. The creeping militarisation of port investments in other countries, from East Africa to South and Southeast Asia can no longer be ruled out. Sri Lanka (whose government admits to being stuck in a 'gigantic debt trap') represents the most obvious case of unsustainable Chinese debt being translated into Chinese control of a port, though Sri Lankan authorities have to assured India that it will still not be used for military purposes. As an indication of its sensitivities about India's concerns, Sri Lanka recently refused permission for a Chinese submarine to dock in Colombo. A case could be made that BRI's hype and flaws mean that it should not be a cause for concern for New Delhi. But national security policy has to account for a variety of scenarios. Given that BRI directly impinges upon India's neighbourhood policy, counter-terrorism objectives, desire for a stable balance of power in Asia, and ability to shape global institutions and norms, it arguably presents the greatest single challenge to India's foreign policy. 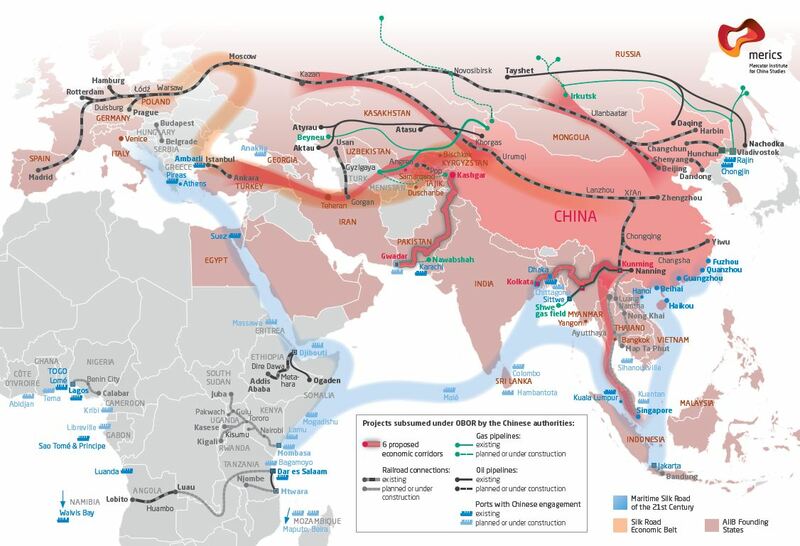 Just glance at a map: from India's perspective, Belt and Road looks a lot like a noose. So what is India doing about this? The idea that India can (or should) compete directly with China overlooks important constraints on India's part. One is that India simply has fewer resources to commit: China's GDP is 4.8 times larger (2.4 times when adjusted for purchasing power parity). A third factor is, of course, that India's infrastructure has traditionally been shabby, although that's gradually changing – the airports in Mumbai, Delhi, and Hyderabad are now world-class, and the same goes for certain small stretches of highway and bridges. India's cities now boast seven metro rail networks and another seven are under construction. Ports, oil refineries, and massive solar plants are starting to dot the Indian landscape. The trouble is that these successes remain exceptions, and are isolated to small pockets of the country. India's infrastructure companies are also over-leveraged, and reluctant to spend more quickly, constraining near-term expansion. Moreover, India's project management record overseas has historically been poor. Despite its smaller resource base, commercial concerns, and infrastructural limitations, India has undertaken a number of important and often overlooked steps to respond to respond to BRI. The first is a refocus on its 'Neighbourhood First' policy, in part to ensure that BRI does not compromise the security of India's periphery. The idea is to go the extra mile and establish disproportionately important and non-reciprocal relationships with its smaller neighbours. Effectively, this means extending Prime Minister Narendra Modi's call for domestic development ('Sabka Saath, Sabka Vikas' or 'collective efforts, inclusive growth') to India's neighbourhood. In practice, this has required giving much more diplomatic attention to India's neighbours. Over the past three years, India's Prime Minister has made significant visits to Nepal, Bangladesh, Sri Lanka, Bhutan, Myanmar, Afghanistan, Seychelles, and Mauritius – in some cases multiple times. Today, those countries all have governments committed to deepening relations with India. Another element involves foreign aid. In 2012, India set up an aid agency (the Development Partnership Administration) that overseas about $1 billion in annual grants, mostly to South Asia and Africa. It has begun or completed some significant regional infrastructure connectivity initiatives, including a major dam and highway in Afghanistan, electricity transmission with Nepal and Bangladesh, and housing projects and railways in Sri Lanka. India has also demonstrated its ability to provide swift humanitarian assistance, including in recent years to Sri Lanka, Nepal, and the Maldives. New Delhi provides technical assistance to other South Asian states and has tried to reinvigorate regionalism. There's been a particular focus on the Indian Ocean, from East Africa to Malacca Straits and beyond. India has committed to develop 'infrastructure' on islands in Mauritius and the Seychelles, and link those countries to an existing India-Sri Lanka-Maldives maritime security cooperation mechanism focused on maritime domain awareness. India already has longstanding arrangements with the Seychelles for surveillance of its Exclusive Economic Zone and has provided Mauritius with an offshore patrol vessel. Ensuring that security competition remains dampened in India's immediate neighbourhood, including the Indian Ocean, has become a high priority. Secondly, India has had to get serious about regional connectivity, particularly eastwards, if it is to play an appropriate economic and commercial role in Asia. ASEAN is now India's fourth-largest trading partner, but India still punches below its weight in Southeast Asia's commercial mix. It does not help that India has traditionally underdeveloped its Northeast and the Andaman and Nicobar Islands, impeding commercial activity with the region. The 2015 Land Boundary Agreement with Bangladesh and the opening up of Myanmar have presented new opportunities. Furthermore, India-ASEAN efforts have received a major push this year, culminating in an invitation to all 10 ASEAN leaders to participate in India's 2018 Republic Day celebrations. At least three major connectivity initiatives are of particular importance, although all have struggled. One is the India-Myanmar-Thailand Trilateral Highway, from Moreh in Manipur to Mae Sot on the Myanmar-Thailand border. Once completed, it will link up with a highway that extends to Vietnam's South China Sea coast. A second initiative, the Kaladan Multi-Modal Transit Transport Project, links Sittwe in Myanmar to the Indian state of Mizoram, connecting India's Northeast to the Bay of Bengal. This project is overdue and over-budget, but is seeing progress. Finally, efforts are being explored to link Chennai to the port of Dawei in Myanmar, which is being developed by Thailand and Japan. These efforts are positive but may not be sufficient – for example, air links between India and Southeast Asia, particularly the likes of Myanmar and Vietnam, remain poor. But IMT, Kaladan, and Chennai-Dawei represent some of the efforts underway to connect India to Southeast Asia, and facilitate a commercial rebalancing for Southeast Asia away from an overdependence on China. A third element of India's response to BRI involves partnerships with other countries that share its concerns. In terms of security partnerships, India has made significant strides with the United States, Japan, and Australia. It now conducts regular naval exercises with all three countries, and participates in high-level bilateral and trilateral (India-US-Japan and India-Japan-Australia) dialogues. The level of coordination on security matters between these countries is now considerable. India also supports Southeast Asian militaries in various ways, whether through technological assistance to Myanmar, training to Vietnamese combat pilots and submarine sailors, access to facilities for Singaporean military exercises, or coordinated maritime patrols with Indonesia. But beyond security cooperation (which builds capacities, improves interoperability, and facilitates information exchange) India has started to coordinate with certain countries on BRI specifically. Japan's efforts have, to date, received the most attention, particularly with the recent unveiling of a vision document for an Asia-Africa Growth Corridor that had been discussed previously by the Indian and Japanese prime ministers. Will these steps – dampening security competition in India's neighbourhood and the Indian Ocean, connecting more purposefully into Southeast Asia, and cooperating with partners in the Indo-Pacific on security and infrastructure – be enough to address India's BRI concerns? Possibly not. India may have the ability, willing partners, and natural geographical advantages to offset some of its concerns in the maritime domain, and the close nature of New Delhi's relationships with the likes of Nepal, Bhutan, Bangladesh, and Sri Lanka is often underappreciated. However, CPEC represents an altogether different challenge, given how little leverage India enjoys with Pakistan. There is a possibility that China's efforts in Pakistan will fail, and that the project may even aggravate tensions between Beijing and Islamabad. There is also a chance, more remote, that it might create new incentives for Pakistan to evolve into a more responsible member of the international community. But a growing political-military nexus between the two countries, as currently seems likely, will further aggravate security competition with India. Reluctantly, New Delhi is now having to come to terms with that prospect.